The Alchaemist. A magic-user subclass for AD&D/OSRIC. The Alchaemist, a magic-user subclass for AD&D. The Alchaemists are those magic-users who specialize in the practice of Alchaemancy, that branch of magic which is concerned with discovering, understanding, and activating the magical potential which is inherent in all natural materials and living things. In fact, in some lands, the term Alchaemancer is used in place of the more commonly given name, Alchaemist. Rather than engaging in spellcraft directly, Alchaemists create Alchaemical Formulae. 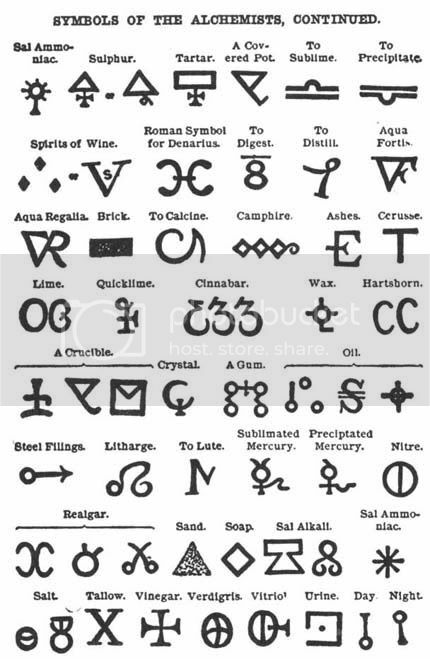 These formulae are complex instructions, often presented in allegorical, or pictographic forms, for the compounding, mixing, distillation, brewing, or otherwise preparing of potions, powders, oils, balms, salves, and other ingestable and applicable mediums which serve to store and convey magic. The alchaemist’s painstaking and careful approach to magic, emphasizing reproducible procedure and orderly methodology, often sets ill with the more individualistic will-workers and arcanists. 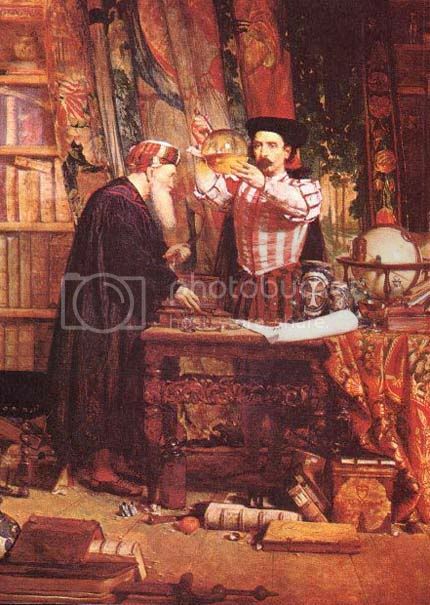 Wizardly and Sorcerous magic-users often look down on Alchaemists as mere artisans to their artists. For their part, alchaemists view standard magic-users as sloppy and perhaps, somewhat primative. Alchaemical formulas are just as well-guarded, rare, and sought after as are the spells of wizards and other magic-users. Alchaemists must create, or search for these ancient and forgotten instructions which make their particular discipline of magic possible. Likewise, an alchaemist must search for, buy, beg, borrow, or steal, the precious ingredients and reagents that make up the material components of their potions and powders. An Alchaemist lucky enough to find one of these formulas must inscribe it into his Alchaemical manual. The manual is a book much like a magic-users spell book. Alchaemical formulae are spell-like in that they will slip from the mind and be lost if not written down. The alchaemical manual is a necessary reference for the alchaemist in his potion making. Alchaemical formulae are divided into levels of power in the same manner as spells. An alchaemist may learn and cast cantrips and first level spells as any magic-user might, but may not learn spells of any higher level. An alchaemist who also learns a standard magic-user spell gives up the ability to create a potion of equal level. The spell takes up the same amount of concentration which the execution of an alchaemical formula would. Standard spells will require the alchaemist to keep a spell book in addition to his alchaemical manual. An alchaemist may not wear armor. An alchaemist may carry a small shield. Weapons available to the alchaemist include all those open to the magic-user, plus the short sword. An alchaemist rolls 1d4 per level for hit points. An alchaemist fights on the magic-user matrix. Note that though an alchaemist may carry a short sword and small shield, he will generally use them only in defense when all else has failed. The constant mixing, grinding and pounding required of a practicing alchaemist gives him greater physical competence than a standard magic-user, but, as he still fights as a magic-user, and rolls d4 hit points per level, hand to hand combat is not his forte. The Alchaemist advances in level on the Magic-user's advancement table. An alchaemist may use any magic item usable by standard magic-users except for magical staffs. The number of alchaemical formulas which an alchaemist can execute in a day is equal to the number of spells a magic-user of the same level may memorize in a day. Refer to the, Spells usable by Class and Level chart for magic-users. An alchaemist may identify any potion with a single drop on the tongue. This is identification of the potion only, not understanding of it’s formulation. Alchaemical potion making is not the same as that practiced by standard magic-users and alchemists. In order to create a specific potion, the alchaemist must possess the necessary alchaemical formula and follow it to the letter. Once the material components have been mixed and processed to readiness, the alchaemist must cast the spell, alchaemancy, on the mixture. This activates it’s magical power. Alchaemancy is unavailable to non-alchaemist magic-users. Alchaemical knowledge is conveyed by a deeply esoteric and symbolic language, the meaning of which, no alchaemist will willingly share with a non-initiate of the craft. A potion created by an alchaemist will retain it’s potency for one week per level of experience of the alchaemist if kept in a non-magical container. The same potion will retain it’s power permanently if contained within an Alchaemical Flask. 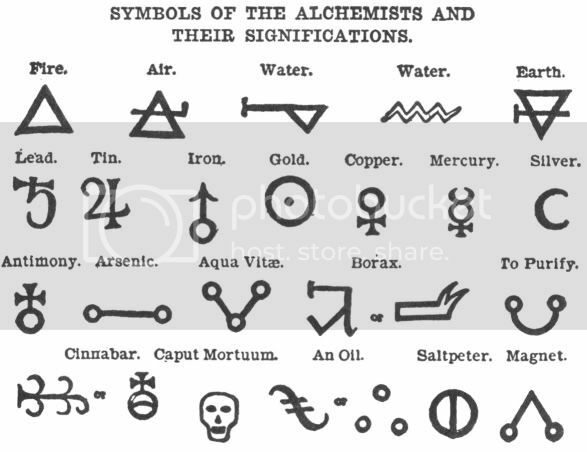 An Alchaemical Flask is defined as any container for liquids or solids, which has been specially constructed and enchanted to hold alchaemical magics. Such a flask must be made of the finest materials and will cost at least 500 gold pieces to make. An alchaemical flask may be reused so long as it is carefully washed with pure water before being refilled in order to prevent potion mixing. If this is not done, the potion miscibility tables must be consulted. An alchaemist may create potions of up to the third level of formulation with the small equipment he is able to carry,"in the field". Alchaemical formulation of greater than third level will require the alchaemist to have access to a fully equipped laboratory and an assistant, or assistants. The workspace and equipment needed to perform the Greater Formulations will cost, at the least, 10,000 gold pieces. The begining alchaemist is assumed to possess an alchaemical manual containing the alchaemancy spell as a parting gift from his teacher. He may also possess three other alchaemical formula of the first level, and a single potion in a non-magical container. There are many schools of alchaemical philosophy. Each strives for certain goals. These schools are not exclusive, alchaemists may belong to more than one school, or to none, as their interests overlap. Of the known schools, those who search for the Elixir of Life are most numerous. The Elixir is said to grant everlasting life, perfect health, and eternal youth to him who rediscovers it’s formula. So powerful is the Elixir of Life, that it is said even to be able to lift the curse of unlife and bring a lich back from it’s deathless state to again become a living and breathing creature. No existent alchaemist is known to have rediscovered the formula for the Elixir. 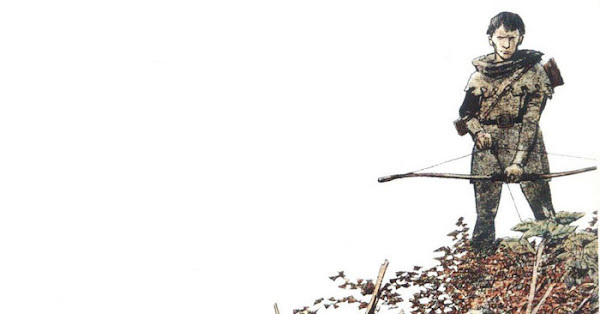 The second most numerous school of alchaemancers are those who search for the Philosopher’s Stone. This material is said to be able to transform base metals into precious ones. Though some seek it solely for the hope of worldly gain, this is not the only reason. 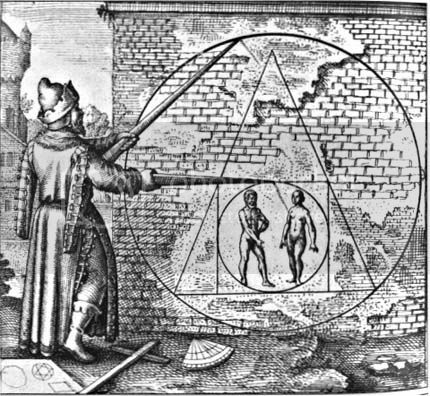 The Philosopher’s stone can be used to separate and refine impurities from any material, and replace any material components required for wizardly spell casting. There are those who say that the substance of the Philosopher’s Stone is in fact, the stuff of elemental existence. That which was before the Gods called the universe into being. It is also argued that in order to create the Elixir of Life, it is first necessary to discover the secret of the Philosopher’s Stone. The truth of this is unknown to the alchaemists of today, and it is a great question which many diligently research. Other associations of alchaemists search for answers to the questions which especially interest them. They bend their studies and expeditions towards the strengthening of metals, the improvement of crops, the making of glass, or any of hundreds of other small preoccupations. These schools are in no way organized or sanctioning. They are simply associations of like-minded individuals who gather, often around a single alchaemist of great reputation, to discuss, argue, and share the knowledge they have gained, and rumors of where ancient and lost formulae may be rediscovered. Here are suggestions for the first two levels of Alchaemical formulae. I’m leaving them fairly rough in outline. When I get a chance, I’ll post a complete set. But for now, this will serve as a place holder, and you mad do-it-yourselfers can just take this and run with it. Put down the scissors first. Alchaemical formulae are the written instructions by which an alchaemist creates his potions. The formulae are rare and sought after in the same manner in which a magic-users spells are. The Dungeon Master is free to determine exactly how much detail he will require in his own game as to the type, nature, and availability of the material components which must go into the creation of a potion. Whatever level of definition is most congenial to the spirit of the game, from making the player character acquire rare and hard to find materials for each formula, to simply hand-waving the procedure, is for the Referee to decide. Players who are susceptible to the lure of power gaming may attempt to turn an alchaemist into a power house or alchaemical grenadier. The savvy Dungeon Master may control such mischief makers by strictly tracking time in the game and requiring the player to keep accurate records of available potion components. As an alchaemist’s potions have a limited life-time, it is not possible for the Player to build too large of a back stock of magic. Additionally, The DM should consider creating a table to deal with the possible consequences of imbibing a potion that has past it’s prime. The magics of alchaemical potions are more often linked to the vitality and level of the drinker than they are to the level of the alchaemist who made them. The personal power of the imbiber is a component of the potions magic, and thus, many of the potions listed here have their duration determined by the level of the drinker, and not by the level of the creating alchaemist. Alchaemy is actually a spell, and not an alchaemical forumula. It is not, however, accessible to standard spell casters. Only alchaemists have the proper mind-set to understand and cast it. The basis of the entire school of Alchaemical magic, Alchaemy is cast upon a potion, powder, oil, etc, after it has been newly mixed. This spell activates the magical potential inherent in the materials of the potion and gives it it’s power. This spell is to alchaemy as Read Magic is to standard magic use. 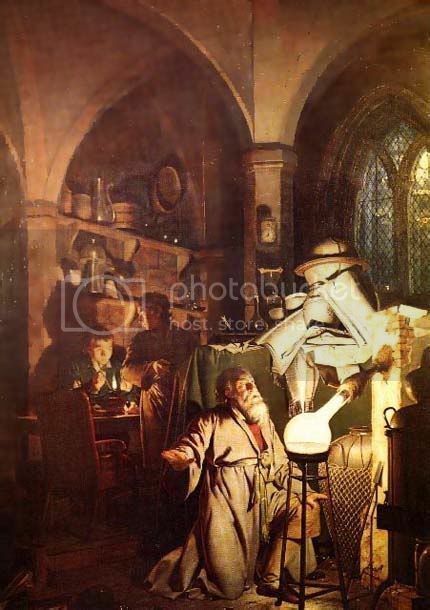 By drinking an entire dose of an unknown potion, and casting Discern Formulation immediately after, the alchaemist can learn the alchemical formulation necessary to recreate the unknown potion. The potion being discerned acts as the material component of the spell and does not take effect normally. The new formula must be inscribed into the alchaemist’s manual within 4 turns or the knowledge will be lost. This does not give the alchaemist the ability to compound the formula if it is above his level of experience. A flame belch potion will give the drinker the ability to belch forth a tongue of flame which will cause 2 points of damage per level of the imbiber. 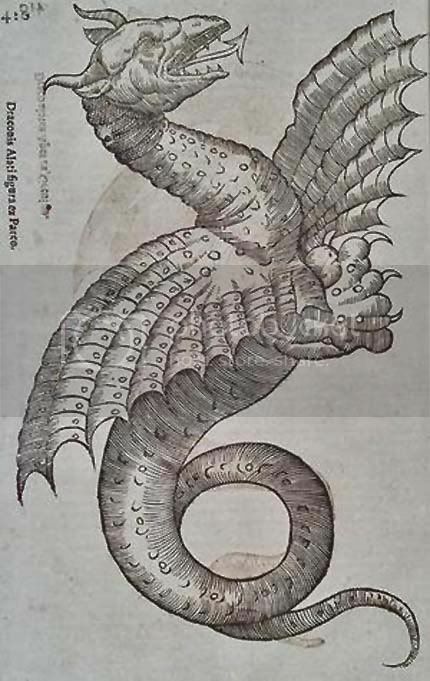 The flame belch will reach 4' per level of the drinker, and is likely to set fire to any combustibles it encounters. This potion functions the same as the magic-user spell Detect Magic, save for it’s longer duration. The drinker will be able to detect magic for 2 turns per level. This is the same potion as the standard animal control potion listed in the AD&D DMG. As the spell, Charm Person. The drinker of this potion may direct it’s enchantment at any one sentient creature. So long as the drinker treats the charmed creature as a comrade and goodfellow , the magic will stay in effect. This is the same potion as listed in the AD&D DMG. Similar to the spell Enlarge, save that it affects only the drinker. The potion will increase the size of a living creature by 25% per hit die or experience level. This change lasts for 1 turn per hit die, or experience level. Similar to the magic-user’s Find Familiar. The formula to summon a laboratory assistant is a dry concoction which is burned in a brazier, emitting a cloud of luminescent smoke. The cloud will dissipate after a time and a humanoid creature, eager to serve the alchaemist will arrive within two days time. The laboratory assistant will act as the alchaemist’s right hand man, running errands, preparing material components, or whatever else the alchaemist needs taken care of. A thick felt pad which is soaked in the alchaemical solution, the eraser will wipe away any form of writing or cartography from any surface. Even letters carved in stone, or graven on metal will be smoothed away by the magic of the eraser. One dose of the potion is good for a use that will clear a 10'x10' area. Harmless to flesh, wood, metal, and glass, stone melt liquefies any type of stone it comes in contact with for a period of 6 turns. After that, the stone will revert to a solid in whatever form it has taken. A finger dipped in the stone melt can be used to inscribe words in stone. This thick yellow glue will bond any two substances together for 10 turns before dissipating into an acrid smoke. A Dispel Magic will dissolve the glue, otherwise, nothing short of a wish can separate the bonded items before the end of the potion’s duration. The glue is kept in it’s own pot, with a special brush to apply it. The formula creates enough glue for 4 uses. When this potion is drunk, the individual may make one 20 foot leap per level of experience. When two persons share a swig from a flask of the confidant’s cordial, Each will be able to speak softly under his breath, and the other will hear what is said, no matter the distance between them. A swig is good for two sentences, spoken and heard by each drinker. The formula creates enough cordial for six swigs. The potion is contained within a clay sphere, and is hurled instead of drunk. When the sphere shatters, the potion vaporizes and rises as a cloud of fumes. All creatures within a 20' x 20' foot space centered on the broken sphere are affected as per the Sleep spell. This potion acts as the magic-user spell, save that any contact with the drinker discharges the potions effects regardless of the drinker’s wishes. Drinker must save or die. Poison must be ingested, it cannot be used to envenom a weapon. This potion turns iron headed and edged weapons away from the drinker for 1 round per level of experience. An attacker with a magic weapon may save vs spell to attempt to hit, and then must roll the attack normally. Non-magical weapons with iron or steel parts may not be forced within melee range of the drinker for the potion’s duration. Iron in the drinker’s possession is not affected. A packet of greasy silver dust. Smeared on the forehead in an alchaemical symbol it functions as a Protection from Evil spell. It does not require a magic circle be drawn on the ground. So long as the bearer of a silvery ward does not act in a hostile manner, creatures of evil alignment may not approach within ten feet of them. A silvery ward lasts for 1 turn per level of the bearer. A packet contains three treatments. Illuminator’s paste is a thick gray gel kept in a heavy waxed paper tube. Objects coated with the paste radiate Light as per the spell. A tube contains 4 treatments worth of paste. Drinker may perfectly reproduce the voice of anyone he has recently heard speak. This effect lasts for 3 rounds per level of the drinker. When a hand full of smoke powder is cast down, it produces a flash and a thick cloud of grey smoke. The smoke obscures an area of 10x10 for 4 rounds. A bag of smoke powder holds 4 handfuls. A powder which when blown into the air, simulates an audible glammer spell in a pre-set manner. The sounds the glamer dust emits may be any sound which the alchaemist has heard for himself. Men talking, a blast of trumpets, the roar of a dragon, and many other sounds have been captured in a straw of glamer dust. The formula produces enough dust for single straw’s full. A non potable potion, sealed within a globe of clear, thick glass. It emits light as a continual light spell. The formula creates enough liquid for a single globe. Poured on the floor in a ring, this potion will obscure the area inside the ring as a darkness spell would. A curtain of impenetrable blackness will rise from the floor and remain for 10 rounds before dissipating. Enough for a single use is made by the formula. For a duration of 1 turn per level of experience, a potion of true sight will allow the drinker to see invisible, or otherwise magically hidden creatures and objects. Instead of being ingested, the dew of forgetfulness is used by dipping the fingers in it and flicking droplets in the target’s face. The target creature will then completely forget the events of the past ten minutes. Spread thinly on objects or surfaces, the paste will act as Sovereign Glue only if touched by someone with larcenous intentions. Dispel Magic will dissolve the Thief-Catcher’s paste. The formula will create three treatments worth of paste. Drinking this potion will increase the imbiber’s Intelligence score for 1 turn per level of experience. Characters drinking the potion of intelligence may receive fresh insight into a problem they are facing. The player will be allowed to ask 1 question directly of the DM, in addition to whatever normal advantage would be conferred by the higher Intelligence score. The Potion of Intelligence must be used with care. Each use after the first incurs a cumulative 5% chance of developing a mental disorder. If such happens, the DM must roll randomly to determine the malady. Same as the spell, save that the potion is cast into the air towards the target, and becomes the web upon contact. The formula creates a single use amount of the potion. Creatures who meet the eyes of the drinker must save vs spell, or flee in terror for 6 rounds. The magic of the potion is expended in a single use. The formula creates 3 doses of potion. As the magic-user spell, Stinking Cloud, except that the drinker of the potion breathes forth the vile cloud of noxious fumes in the direction of his target. The formula creates enough potion for a single use. May discolor the teeth. Similar to the magic-user’s Knock spell. No locked portal, chest, or container of any sort will withstand the drinker of a Rap potion. A soft tapping will cause anything which can be opened, to do so. A single dose of the potion enables the drinker to rap three times. The formula creates one dose. This potion is not drunk, but spread or poured. It will make a 10'x10' area completely frictionless for a duration of 5 turns. No matter the material, stone, dirt, grass, carpet, etc, no creature will be able to stand or walk normally without falling. A creature who falls in the center of an area treated with the jester’s friend will be unable to escape the treated space if unable to reach beyond it’s area of effect. When cast into the air, and a directional, or locational question is asked, this glittery dust will briefly form an arrow pointing in the correct direction as it drifts to the floor. Questions must be a single, clear sentence. "Which way is least dangerous?" or " Which way lies the way out?" The formula creates enough guidance powder for three questions. Gyrgieno, the Black Charlatan. An NPC-antagonist to inflict on your players. A gleeful murderer, a pitiless robber, a wine guzzler, a cad, and a ruiner of women, Gyrgieno the Black Charlatan is a thief of no small skill, and greater than average affinity for magic. Though he hasn't enough talent to actually cast spells, he can decipher magical writings and utilize scrolls with only a 5% chance of failure, rather than the standard 25% chance of most other thieves. Long, if unguided, study of pilfered tomes and alchemical manuals has allowed Gyrgieno to learn to compound weak potions of limited duration and effect. His self-taught arcane dabblings are dangerous to the user, and unpredictable in effect, but, as he himself never imbibes his own experimental concoctions, but instead slyly administers them to unknowing dupes and pawns, his lack of procedural rigor concerns him not at all. Gyrgieno often carries with him potions he has made, and will attempt to sell them to any who appear gullible enough to fall for his artful presentation. On his person he currently carries, a potion of Haste, which will affect only one of the drinker's legs. Which will cause him to run in circles, or into walls. A potion of Growth which will affect only the drinker's head, causing it to grow to three times normal size. And a potion of Nightsight, which will give the drinker excellent night vision, but which does so by permanently transforming their eyeballs into fixed rod-shaped owl eyes. The drinker must then turn his head to see and can only perceive what he directly faces. One potion which he does not sell is his favorite. He refers to it as, "the cur-bringer". This potion inflicts a weak form of were-wolfery upon the drinker. 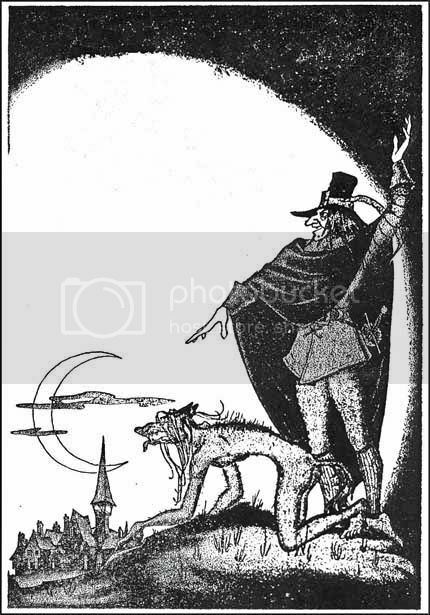 Upon the rising of the next crescent moon, the victim becomes a wretched, hairless wolf-man, totally under the control of Gyrgieno. The Black Charlatan employs this potion in a particular manner. Frequenting taverns, inns, and bawdy halls, he begins conversations by asking for tales of adventure, and news of abroad of travelers and strangers. Once the conversation has gone on long enough for those present to have forgotten that he himself instigated it, Gyrgieno will tell a tale of the rumors he has heard concerning the fearsome werewolf bandits who have begun to prey on night travelers on the local roads. He will be most descriptive of the horrors visited upon the werewolves victims, and will relate the rumor that only by flinging to the lycanthropic robbers all valuables and fleeing in haste, might the worst be averted. He will tell this story several days in a row to be sure the tale has made the rounds before he spikes the drink of a chosen pawn with the cur-bringer and waits for the crescent moon. A potion-cur can do only 1-4 points of damage with bite or claw and attacks twice per round. The cur is armor class 9 and retains it's normal hit point total. In the thrall of the potion, the victim is unthinkingly obedient to Gyrgieno. The cur-bringer will work for one month only per dose. At sunrise, the cur reverts to normal form and is unaware of the night's events. In the mean time, Gyrgieno will pick out likely targets, and when the chance arises, he will send the potion-cur to rob them, preferably on the road and alone. When confronted by the dread werewolf bandit, most victims flee in terror after throwing their gold to the ground. Should one find his spine and the potion-cur be slain, it is of no matter to Gyrgieno. New dupes can always be created. Gyrgieno is tall, spare, hook-nosed, and lank-haired, but he is an engaging speaker. Bumpkins will think him well traveled, and the sophisticated will consider him harmless local color. He is armed with a cut-and-thrust sword he calls Fortune Filch. The blade is +1 and on a hit it siphons luck from it's target and transfers it to it's wielder. This takes the form of a two point bonus for the wielder's next saving throw, and a two point penalty on the victim's next save. This can only happen once to a particular opponent per fight. Gyrgieno will also carry, or have available to him, all the standard items which a thief may favor. He will not engage in direct personal combat unless escape is impossible. * This pic is by Boris Dolgov and from a 1947 issue of Weird Tales. Courtesy of Mr Door Tree at Golden Age Comic Book Stories. The ideal RPG table shape. and a short rant about crappy journalism. Sunday mornings, I like to get my giant, steaming cup of coffee, a note book to jot down any stray thoughts on gaming, make myself comfy on the couch with the dog at my feet, and yell at the TV. I switch back and forth on the various talk/news shows, or what passes for news nowadays, and Meet the Press is second only to that smarmy gnome Stephanopoloulos for raising my ire. If the media would like to know how they can stop losing ground to internet blogs and radio shows, my suggestion would be to do real journalism. In the eighth grade, Mrs Black taught me that a story was, who, what, when, why, and how. Not lies, spin, innuendo, revisionism, and disingenuousness. Contemporary TV news is a parade of nit-wits asking stupid questions about the wrong stories of mendacious, self-serving government stooges and snake oil selling experts. I play a game of predicting just how the anchor intends to slant the presentation of the story to serve his views, or the views he has been given to represent by his corporate masters and The Party. 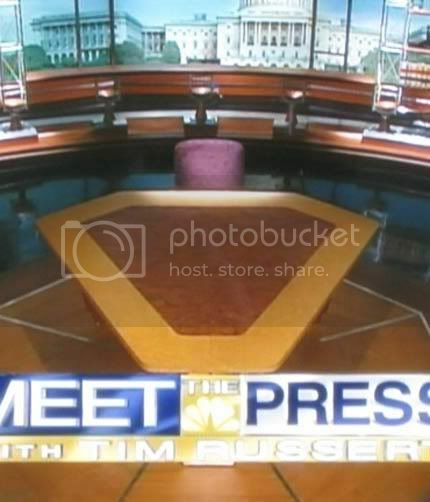 Meet the press has always been easily predictable in this regard, both with Russert, and the new guy, what'shisname. I don't even bother with FOX news. When they lie, it's too obvious, no challenge. The lefty news is much better at candy coating their bull so that people will swallow it. It does seem that they've become more open and less artful about it since the democrat wing of The Party got the upper hand. They do, however, have a very nice table. I've seen lots of ultimate game table designs and projects on line, but this is more about the shape of the top. I don't really need lots of bells and whistles on a game table. We have a simple style of play. Electronics and message tubes and sunken mats are just too much gimmickry for us. I don't think that I'd have cupholders or anything like that in the table itself. Maybe in the chairs. I don't like food or drinks on the table during the game. Role playing is a face to face endeavor, and I want the table to support and maximize that. As you can see in the pics, it's a six sided design, like a superman emblem, but with the bottom point clipped off. 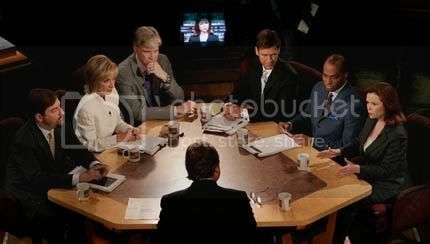 The interviewer sits at the top, or the head of the table, and the guests face him along the long sides. I think this would make an excellent arrangement for role playing gaming, since the outer players face the GM as well as the inner players do. Also, the GM can see everyone else clearly too. Now, the Meet the Press table is wider at the interviewer's end and narrower at the guest's end than I would have it as a game table. It's built that way so the cameras have room to get unobstructed views of the guests faces while they spin and lie. On a game table version, I'd make the table a bit longer and both wider at the end, and narrower at the head. Almost a classic coffin shape. I don't know that I'd make it for more than 4-6 players, but that's my preferred size for a group. I have a hard time handling more than that in a game at the same time. This is all, of course, concerning a gaming only table. If you don't have the room for a dedicated table just for the game, then I think a normal rectangle is fine. I think the style of play you prefer makes the difference in deciding what your "ultimate game table" is going to be like. Lot's of gamers like the conversation pit type set up, couches around a coffee table, but I find that a bit too relaxed. When I've played that way, the game often turned into a gab session. I know lots of you guys use laptops at the table now too, but the presence of electronics is a deal breaker for me. No real world technology in my fantasy world simulation thank you. Yeah, yeah, I know I'm saying this on a freaken blog on the internet, I don't have a problem with double standards. Good for talking about the game, not good for playing the game. Materials make a big difference as well, the table would have to be solid wood, preferably a hardwood. And dark and scarred. I like things to look old and well used. Like a hundred year old pub table. I might put a leather insert in the middle of the surface. Man made materials, fiberboard, linoleum, plywood, are also right out. Just like the electronics, they jar against my sense of immersion. Here's the table from the other end, sans weasles. I'd like to know the actual measurments of the studio table to see just how much I'd have to tweek it for gaming. I've also never gotton a look at the support system, so I don't know if it's a fixed pedestal, or a trestle set up of some sort. Any table that has to deal with excited gamers beating on it needs to have strong support. And maybe a bolt-to-the-floor option to avoid those TPK table flips. The Handsnake, or, Ha! Blordel was wuss-slapped by a snake! Alignment: Variable, roll for each individual, or DM choice. A Handsnake appears to be a large, heavy -bodied serpent, with a scaled human hand in place of a head. The origin of these strange creatures is unknown, but presumed by interested parties to be magical. Handsnakes are highly individual in temperament. They may be rude, humorous, cruel, lascivious, helpful, etc. An encounter with a handsnake may be either a boon, or a bane to a party, depending on how they handle the meeting. A handsnake is intelligent, but having no mouth, cannot speak. Instead, they communicate with universally understood hand gestures, or, they may be taught to employ an actual sign language. A handsnake may attack by coiling and striking as an adder would, but instead of biting with fangs, it will punch with it's fist, or attempt to blind by poking an attacker in the eyes. A handsnake is capable of wielding a dagger, or hurling rocks, and it's strength in doing so is equal to an adult halfling. Handsnakes are quirky in their motivations. They have been known to stealthily slither into campsites unnoticed and make off with odd items. Some have proven very friendly and given to offering unnerving handshakes to passers bye. 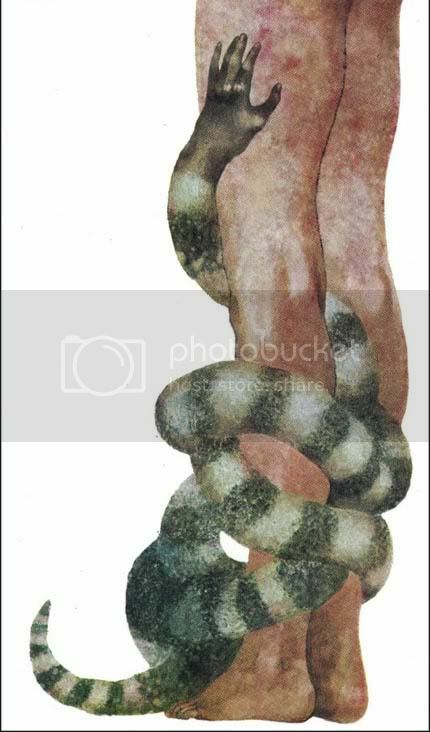 One tale tells of a handsnake murdering a sleeping woman by coiling about her throat and griping its own body with it's hand until she was asphyxiated. Another story relates the actions of a handsnake known as the Insulting Serpent, which apparently made a habit of proffering rude gestures to travellers on the Hocknell road. The Gold Miner, is the name given to a handsnake which seems to live near the gnome warrens of Gluraumgh. It is much despised for it's game of sneaking up on the unsuspecting and suddenly thrusting one of it fingers deep in the nose of it's victim. A young handsnake, known as a fingerling, can be raised to be a henchman, or summoned to serve as a familiar. If well treated, they can be invaluable helping hands. A handsnake does not eat as would a normal snake. It appears that they live by drawing off minute amounts of energy from both living things, and magic items. Large animals, such as horses and cattle, are sought out by handsnakes as steady sources of sustenance. Despite their unnatural form, the presence of a handsnake is often accepted by these farm and draft animals as it will bring them apples or other treats, and thus win their favor. A normal, healthy creature of a size larger than a rat will suffer no harm by the feeding of a handsnake, no more than it would by a normal snake seeking the heat of it's body. However, there could possibly be some danger to those gravely wounded, or very small creatures such as pixies or sprites. Like wise, magic items which carry a permanent enchantment will not be harmed by a handsnakes energy basking. There is some small chance, (5%), that magic items which expend charges, such as wands, may be spontaneously drained by a handsnake. There are stories, certainly spurious, which tell of monstrously huge handsnakes dwelling far to the south, in the reeking jungles of the equatorial region. These stories are of course, not true, however, if they were true, such a handsnake would be 30 to 60 feet in length, with a hand the size of a giants, and 6 hit dice. Luckily, there is no such thing as a Handaconda. Stand away from the drain grate, lass! There be Otyugherds in the sewers. So, I've been working, on and off, on a rules addition for AD&D to better simulate the themes and events of Sword & Planet, and science fantasy fiction. I'm calling it Weird Space for the time being. It isn't going to be a stand-alone game, but instead, a bolt-on rule set to modify AD&D enough to make play smoother for this particular genre of fiction. Anyway, I'm Googling around last night, looking for more inspirational art to give me ideas for Weird Space, and I hit on pics from Weird Science, a movie which I'm sure that Old School D&D blog readers are old enough to remember. I loved that movie. Kelly LeBrock, Anthony Michael Hall, and... Oingo Boingo! Yah! One of the pics is of the thing that Lisa,(LeBrock), turns evil older brother Chet,(Bill Paxton), into. 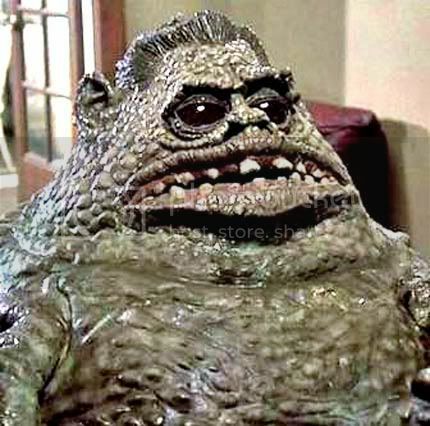 I used to be into science fiction movie prop replica building, and effects stuff, and the prop guys referred to the Chet/thing as, "The Sh*t Monster". "Ah-Ha! ", said the part of my brain which never stops blathering to itself about D&D, "That reminds me of Otyughs, Maybe the Chet/thing is a Otyugh/human fusion!" Special defenses: Revolting, Save vs poison in order to approach within melee range. Though the great cities dazzle visiting country folk and bumpkins, with their towers and palaces reaching high into the sky, these places reach just as far below the level of the streets with their cisterns and wells, their dungeons and sewers. All things bright and wondrous are balanced equally with those things both foul and dark. When an Otyugh is employed in the sewers of a large city, Otyugherds are often a part of the arrangement. Functioning as both keepers and servants of the Otyugh, they scour the adjoining tunnels to bring it choice bits of offal which may have lodged here and there and escaped the sewer currents. This activity keeps the sewers open and flowing. Otyugherds clear offal jams, dung damns, and the corpses of those who may have run afoul of the Hidden Guild. Squatly conical, and only vaguely humanoid, the origin of the Otyugherds is unknown, and unsettling to speculate on. Well adapted to their sewer dwelling lives, Otyugherds move only slowly by scooting themselves along on their broad and callused buttocks. Their short, and relatively weak arms and legs cannot bear their full weight. Revolting in both mind and body, Otyugherds are vile creatures and any helpless victim who falls into their clutches can expect to suffer the most horrid perversions before their deaths, and likely afterwards as well. Though their flabby hands may grip, only their bite causes damage. Anyone bitten by an otyugherd suffers and 80% chance of contracting some disease. Often typhus, or cholera. Once per day, an otyugherd may explosively empty it's bowls, releasing a caustic gas. All those within 20' of the otyugherd must save vs poison or take 1d6 points of sinus damage and either vomit in nausea, or flee for 3 rounds. 50% chance of either. Just imagine inflicting a half dozen of these on your players in some filthy sewer. It'll be hysterical! "From my heart and from my hands, why don't people understand, my intentions?"